How Many Cartoon Character Eyes Do You Recognize? Think you know a lot of cartoon characters? 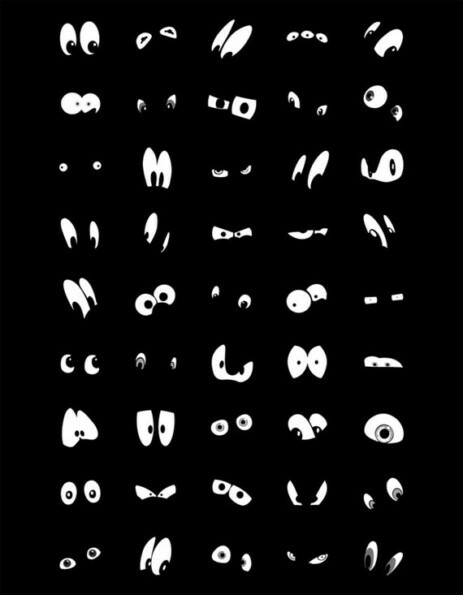 Put it to the test with the Famous Cartoon Character Eyes poster by Yoni Alter. It features 45 pairs of eyes of characters including Kermit the Frog, Sonic the Hedgehog, Bart Simpson, SpongeBob and tons more. Most of the characters are pretty unmistakable from their eyes alone, but the artist has provided a handy cheat sheet just in case. But one has to wonder, what are all of these characters doing in the dark together and why are they staring at us? They must be plotting to take over the real world. I knew I shouldn’t trust that Dora the Explorer—her vacant stare is so creepy. And what kind of parents let their kid just wander the jungle with a monkey? I bet she chopped them up and fed them to her backpack. ¡Delicioso!